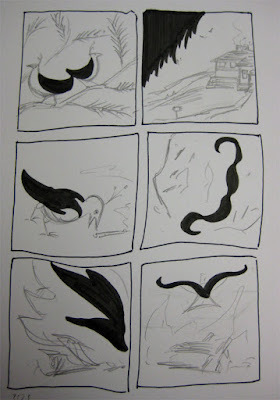 Thanks to all of you who commented on my improvised comic activity. If you explore the comments you will find several links, including one that was just sent to me a few hours ago. After the jump, two variations on the activity that I found to be particularly fruitful. Isaac Cates and Michael Wenthe to my activity in the direction of collaboration and jam comics, with each artist drawing plots for the other to turn into coherent shapes. Then they exchange two more times to end up with a finished comics. What’s nice about this is the way it ensures spontaneity: you can’t help yourself in advance by tailoring your “random” blobs to some kind of narrative you may see developing. You can see two results here. 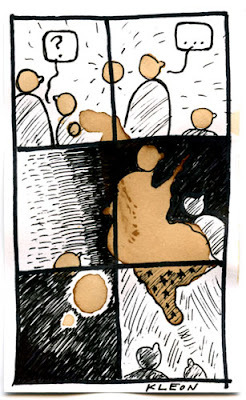 Instead of doing ink blots, Austin Kleon made marks by dropping a teabag on his page and then turned it into a comic using ink, resulting in a comic that is both two-toned but also where you can clearly see the original marks even after they’ve been transformed. You can see several examples here.